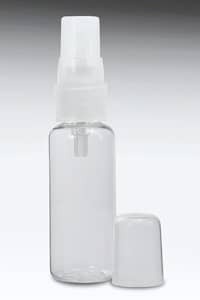 A clear PET plastic bottle with semi transparent atomizer spray top and cap. Excellent if your product needs to be sprayed as a fine mist. Suitable for your sugar & lemon henna sealant, beauty products, tanning lotions, room fresheners or your latest homeopathic oils.